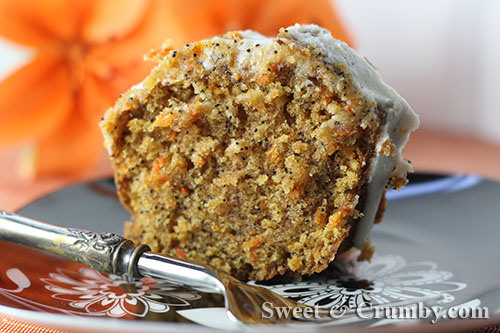 Perhaps you should try this Carrot and Poppy Seed Bundt Cake. It is honestly surprisingly scrumptious. I only say surprisingly because it is not chocolate, but it is pleasantly different, pretty and hits many notes of flavor with the sweet carrots, licorice-y poppy seeds and all in an easy to make bundt cake. This is a 3/10 for difficulty and time IF you have a food processor to grate your carrots. Otherwise, it may shoot up to a solid 7 for pain in the assness (I hate grating carrots and in my personal experience no one likes to get a smidgen of skin in their cake from my scraped up knuckles). I NEVER claim to be coordinated. Never ever. 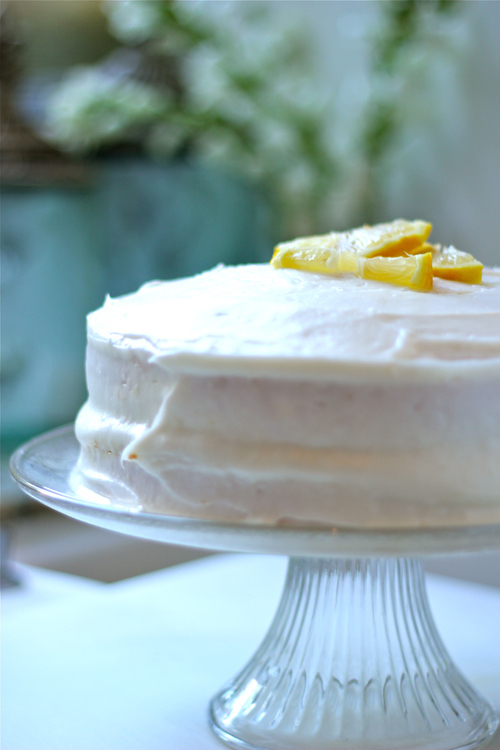 My Lemon Layer Chiffon Cake Filled with Lemon Curd is a stunning show piece for any Easter table and would make any hostess shout with glee if you brought it to her party. It is definitely a 10/10 for fussiness, but if you have a good brand of prepared Lemon Curd you like that helps make it more do-able. 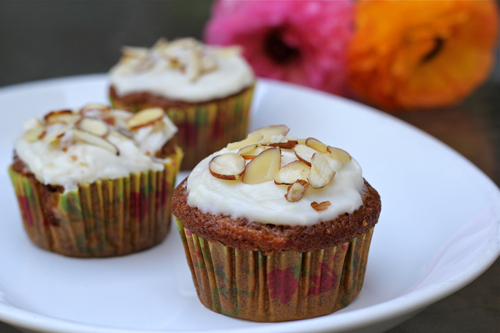 My spicy Parsnip Cupcakes with Tangy Cream Cheese Frosting are addicting, disappear in minutes and are EASY to make (3/10). Again, the easy part depends on you having a food processor. Otherwise, same problem as in the Carrot Cake above. 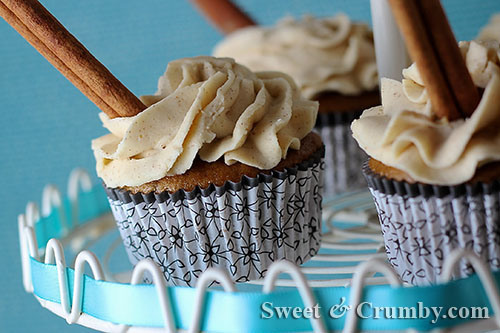 And for My GF Followers, I would highly recommend making my Gluten Free Cinnamon Spice Cupcakes with Cinnamon Butter Cream. My blog started before we started to eat more Gluten Free so I don’t have many GF recipes for the occasion yet. In my experience, most cakes and cupcakes can be made gluten free by using my GF Flour Blend 1 in place of AP flour, adding 3/4 a teaspoon of Xanthan gum and only including 1/4 a teaspoon of salt regardless of the recipe. This tends to work well. I hope everyone has a Happy Easter, and to those celebrating Passover, I wish you a wonderful Passover as well. Happy Easter, Geni! 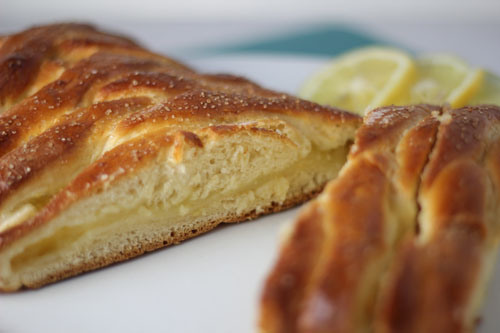 That braided bread with lemon curd filling is my favourite. All look delicious! I love the breads/yeast-based sweets this time of year 🙂 Was lucky enough to be in Germany where I completely over-indulged! oh they all look amazing especially that chiffon cake!